A posh brasserie in front of the Arc de Triomphe. : Celebrities patronize this luxury brasserie in front of the Arc de Triomphe, which can be seen through huge windows, along with the lively Place de l’Étoile. 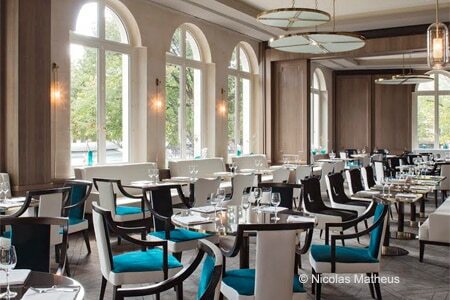 The posh setting of the dining room has been entrusted to Sarah Lavoine (the spouse of a famous French singer). Served by model lookalikes is the valiant fare of chef Alexandre Auger, former stalwart of Yannick Alléno at Le Meurice. Menu items include tuna tataki aromatized with honey mayonnaise and wasabi; quality cuts of beef, such as the Black Angus rib steak with french fries; and a well-done Guanaja chocolate tartlet. As one can imagine, due to the location and the environs, prices are quite stiff, notwithstanding the lunch menu at €36.